The collection presents the results of scientific and practical research of the authors, describes the best practices for solving problems of multicultural education and the study of Russian language and literature in the multilingual environment of the North-East of Russia, topical issues of Russian science in the countries of the Asia-Pacific region, education of the linguistic personality in the context of a dialogue of cultures, as well as ways of solving the scientific and practical tasks of social communications in a multicultural region are characterized. The research materials were tested and transmitted to the professional community in the framework of the IV International Part-time Scientific-Practical Conference (Yakutsk – Harbin, November 1–20, 2018). Propopsed for researchers, teachers of various educational organizations, students of advanced training courses, doctoral students, graduate students, undergraduates, bachelors of relevant areas of training, practitioners. Collection of scientific papers is prepared on the materials provided in electronic form, retains the author's edition. the article considers the role of culturological information in formation and development of cognitive interest for foreign language studies. A wish to study in Russia witnesses on the fact that foreign students have psychological readiness to study the Russian language, learn about Russian history and culture. 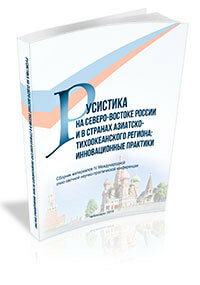 The interest for Russian culture is a basis for the positive attitude to the language and a motive for studying it. As an example, the author gives topics for essays and public speeches used in classes of Russian as a foreign language. being in the process of intensive transformations, the system of higher education requires the presence of specialists with new competencies. As a result of the Bologna process, the intensity of international integration and modernization is occurring all over the world, particularly in Japan. For Russia’s successful educational reform, it is crucial to study international experience and tendencies in education policy. the work covers theoretical and practical aspects of comparative studies in education systems. Aiming at acquainting the readers of the journal with the fundamentals of comparative studies in higher education systems, the author describes basic levels, principles, methods, aims and tasks, as well as the streamlines of comparative studies in the sphere. The author analyzes comparative studies of different levels conducted by foreign researchers for the last 15 years identifying research streamlines (including comparative researches of higher school administrations, distant education, ECTS and other credit systems), their key characteristics, their advantages and prospects. The researcher also determines the aggregate subject of comparative studies in higher education systems at the initial level; formulateы tasks, set before the Russian comparative researchers of higher education systems and highlights possible ways to solve them. The article considers the possibility of using free software as an alternative calculation tool for psychological research. The use of SPO instead of commercial-proprietary will minimize the cost of technical support of scientific research.